Again, my list is opinion-based when it comes to the ranking of the songs. You may either play the video first in the bottom of the post while reading my comments on them or vice versa. Feel free to do whatever suits you. Again, these are my guidelines when it comes to positioning the rankings of the songs. 1. Is the music catchy? 2. Is the visual pleasing to the eye? Does it match the song? 3. Does it give a certain feeling on me when I listen/watch it? Is it intense? Those are the guidelines that helped me pick the right positions for the songs I liked this season. Lots of the endings I've included were so intense emotionally and for that, one clue I can give you regarding this top list is that this season's ballads completely took over and dominated the list! A lot of them had the potential to be the top 1 song but unfortunately, some had to be lower. That doesn't mean I don't like them however! I love all of the songs I've included here. A short note that needs to get out there as well is the fact that most (if not, all) of the endings in the higher positions are usually the ones that came from animes that I've watched this season. You might say it's biased because of the fact that those that I haven't watched gets to have a higher chance to be in a lower position but again, this is my top openings. This is merely my opinion on this. Don't worry though, there are some songs, from animes I haven't watched, that are incredibly high in this list (even higher than some of the endings that I've watched). You also might see some songs that you wouldn't expect to be in a higher position (some of them are songs you wouldn't even expect to be in the list itself). But again, these are just my personal preferences (refer to the guidelines stated above). I'll try to discuss each and every one of them and tell you why I placed them in that position. Yep! Lots of the endings were so good that I had to put a bonus song in it as an additional item to the list. Nijiiro Days' ending 5 gets me in the groove! I got to hear this ending from the other top lists that I watched. I loved this song's chorus. It's so jumpy! I don't know if that's the right adjective to describe it though but that's the closest I can get. I got to hear this ending from the other top lists that I watched. Just like Macross Delta's ending, I also find this song bouncy to resist dancing while sitting in your chair. I got to hear this ending from the other top lists that I watched! This song's vocals are so soulful and heartfelt. This ending is just so cute, song and visual-wise! Simple as that! I used to skip this ending whenever it would show up in those lists that I've watched but then one time, I was watching this top endings list on 1.25 speed and this song came on! It was one of the best things that my ears got to hear. Another strong ballad that my heart got to savor whenever I would hear this in the other top lists I've watched. Yes! 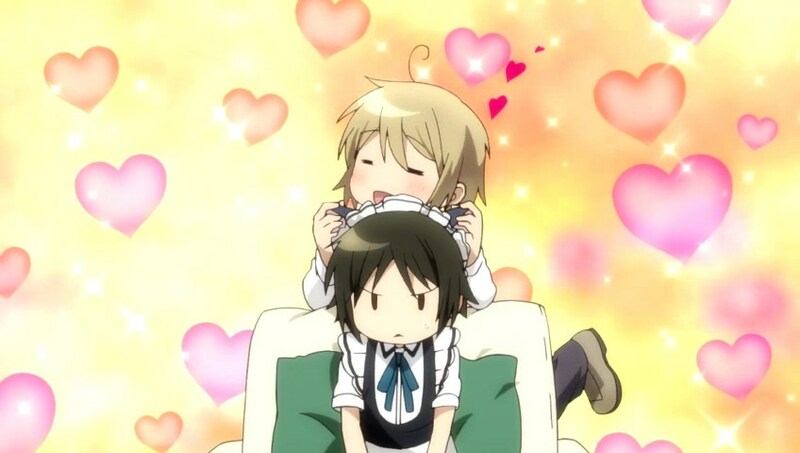 Time for some Shounen Maid! This song is so catchy. The visuals were so funny and entertaining as well! This show is going to end in this week's Saturday by the way and I'm having mixed emotions about it right now. At last, another ballad! This one tamed my heart with it's slow and pure vocals. Together with it's simplistic visuals, this stripped-back ending takes me on a break from all the other bright and fast-paced endings in this season. A powerful ballad with stunning visuals from one of this season's famous show! I don't understand this song's lyrics because I didn't learn Japanese but, for some reason, this ending as a whole, both the music and the visuals, gives me an inspirational feeling whenever I listen to it. It makes me motivated to do anything! I tend to imagine that I'm Izuku Midoriya whenever this song plays. He's such an adorable person. I love him. This song, frankly, entered this late at a pretty late time because I forgot to add it! This is a really beautiful song that definitely deserves this position. Everything about is just catchy! I'm playing the video presentation while typing all these descriptions and one thing I realized is that both Re:zero's opening and ending were in the same position: top 11! This song's vocals together with it's instrumental makes it an absolute hip-swaying machine. This song was an underdog in this list. I didn't really get to know this song until, only a few weeks ago. This song instantly gave me that adventurous vibe going on which can also be seen in the bright scenery seen in it's visuals. I constantly play this song whenever I walk to school. Another Nijiiro Days' song! I loved all of Nijiiro Days' OST but out of all it's endings this season, this cute pop-like ballad is one of the songs I really enjoyed listening to the most. I don't know why but to be honest, something about this song gives me the feeling of de ja vu. This ending is also the last underdog to rise up so high on this list as I've literally just heard this song for the first time a day ago! It's one of my absolute favorites in this list. It was really hard trying to trim parts of this ending because I really adored this one. You could see how frustrating it was because I literally tweeted about it. omg it's hard to cut/edit Nijiiro Days' ed 6 cuz its so beautiful and i want to put the whole song in it. I have to admit, I didn't expect this anime to have an ending theme song of this kind. Literally! I mean who would right? This anime's main character has been shown to be one of the most coolest anime characters around! And to be given such an amazing ballad as it's ending? That made me so speechless when I first thought about it. This anime's opening was also cool in it's own way - fast paced, rock-n-roll type of jam and that was perfect for the anime's theme! But this song gave this anime a new color - in a positive way. I loved it. This wonderful ballad also gave me goosebumps because it also had me feeling de ja vu. Is it because of how the instruments sounded like? Or was it the vocals that sounded like I've already heard it before? We'll never know. Ahh! The Kiznaiver feels are coming back! I just finished watching it's last episode a few days ago and when this ending song played for the last time, I cried. This ballad never fails to touch my heart so much. The enchanting first notes on the piano, the fragile vocals on it's first verses, and the heart-warming chorus played on a really simple yet meaningful and deep visual composition makes me miss this anime even more! I loved the feeling it gives me. Another one of my all-time most favorite endings this season. I'd probably re-watch this anime again to be honest. It's that good! Yes! We're having two top 2s today! The next top 2 in this list is Bungou Stray Dogs' powerful ballad. Deciding the top 2 of this list was really hard because Kiznaiver and Stray Dogs' ending themes were just so good. The emotions of each song had a really huge impact on me that it was sad to label one as lower than the other. I had to make them both top 2. Bungou Stray Dogs' ending also grasped me with it's symbolic visuals and ear-grasping song. No wonder why some people also considered this song to be one of the best this season. Gotcha! I'm sure you didn't expect this song to be here as well. If you did, then hats off to you for having a really special ear for this ending right here. This song, frankly in my opinion, is the most underrated ending theme this season ever had! Only less people got to acknowledge how wonderful this song really is. Because of it being underrated, this song get's to be a special one in this list! If you'll ask me why, out of all the other songs, did I consider this to be the best this season? I'd say that this ending has the ultimate combination of all the comments I did on most of the ballads I've included in this list: 1. The throwback-ish sound makes it a magnet for the de ja vu feels. 2. The catchy melody it had that made it really easy to sing along to. 3. The powerful and raw vocals that you can clearly hear in the chorus and also... 4. It's really unique take on the visuals. The colored-pencil art on it's abstract watercolor background really contributed to the overall feel this ending exhibits to people. If you haven't heard this ending yet, please do! It's awesome! On to the video presentation! Thanks for reading! What are YOUR favorite Spring 2016 Endings? Titles with the red asterisk indicate a late addition to the list! 1. This is the second to the last of the top list series I have in stored for this season! 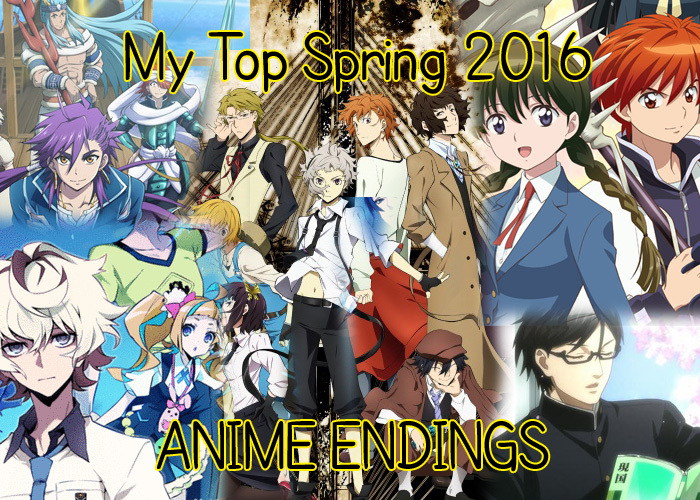 The last one - my overall top anime shows for spring 2016 will be coming in the last few days of Spring. 2. Also, don't forget to come back and visit this blog again soon for I will be posting my top summer 2016 anime watchlist! 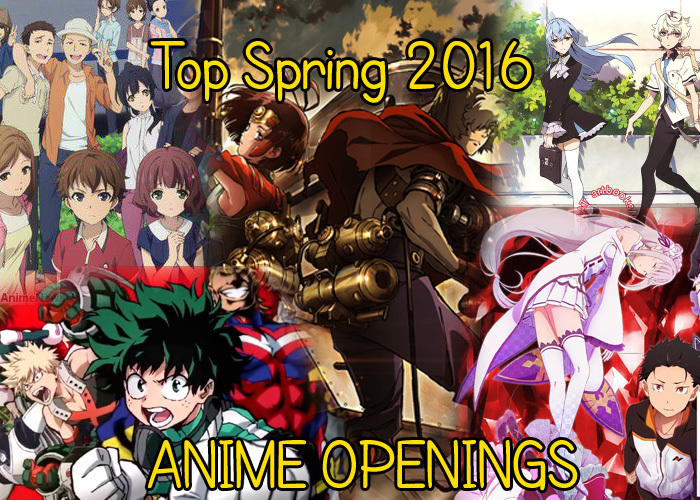 My Top 20 Spring 2016 Anime Openings! Yep. You've heard that right. I've finally compiled & created the video presentation for my top 20 spring 2016 anime openings list. I had so much trouble trying to avoid copyright on it but I gave up. It literally took me 8 tries (8 uploads and 8 edits) to give up and just post it on my Google Drive account! But anyways, enough of that! The good thing is that the list is finally here. Generally, my list is opinion-based when it comes to the ranking of the songs. I don't necessarily have a rubric that I used to rate these but I do have some guidelines. 2. Is the visual pleasing to the eye? 3. Does it give a certain feeling on me when I listen to it? Is it intense? 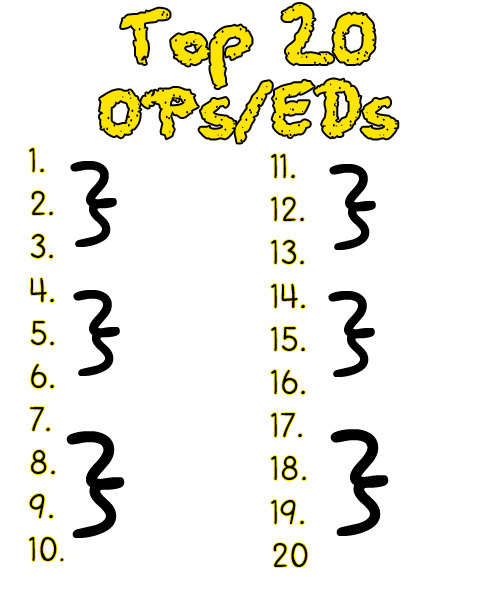 A short note that needs to get out there as well is the fact that most (if not, all) of the openings in the higher positions are usually the ones that came from the animes that I've watched this season. These openings from the animes that I've watched tend to give me more of the "intense feeling" that was also used as one of the basis for the ranks. You might say it's biased because of the fact that those that I haven't watched gets to have a higher chance to be in a lower position but again, this is my top openings. This is merely my opinion on this. Like for instance... my top 10 opening this season. I'm sure no one would expect that song to be there. Other influence for the positions of some of the songs is because I, too, like to watch all the other people's top openings this season and that gave me an opportunity to hear other catchy songs this season. Probably without that, I'd only have a top 10 right now but because of that, I got 20! I'd probably just mention those openings that I got to put here because I heard them in other's people's list and thought they were catchy as well. One of the first few Spring Animes that I've watched (that got to be on-hold for a while). This opening is cute overall! I got to hear this opening from the other top lists that I watched. It was catchy indeed. This opening was just not my type in the start because the voice wasn't my cup of tea. I also dropped this anime by the way because I wasn't feeling anything from it. But anyways, the chorus was good enough though so it got itself in this position. This is an anime that I haven't watched and I only got to hear this opening from the other top lists that I watched! It was catchy as well! This is also one of those animes I didn't get to watch this spring but again, I heard this from the other lists. Another anime that I didn't watch because I believe this anime didn't start this season so if I wanted to watch this, I had to watch the first ones before this but anyways, it was a catchy song indeed! Not to mention the video was so "crazy and bizarre"! Finally! We came to a point where in I get to tell you of an anime I was able to watch (and actually enjoy). This song is so good! I loved the first opening and I also loved this one! An anime that I'm also watching that I can never really get to binge-watch. This anime just makes me so relaxed and sleepy after watching it and that I couldn't press another one because I had to sleep. The opening was also calming and chill. Another anime that I didn't watch this season but the song was so good! I had to put it here. An anime that I only got to watch recently. I can see the hype over this show but I haven't got to watch a few of it's latest episodes. Anyways this song is worth the listen! This song is probably the one that will get y'all surprised. Out of all the top lists from other people that I've watched, this song rarely gets to be in those lists. If it does, it's usually a really low position. I don't know about the others but this song just makes me so happy whenever I listen to it. The bright and cheery visuals makes it a mood up-lifter! I really recommend you all to listen to it. Oh and by the way, I loved the anime as well! Can't wait for season 2 next year! This song is that song that makes you want to jump on your seat, sing the chorus and strut out that imaginary air guitar you have. In other words, this opening simply rocks! + the anime was so awesome too. This is probably the highest position I ever gave to an opening from a show that I haven't watched! This song just gives you that adrenaline rush after the first line of the chorus. The visuals also matched the pacing! This song's first few notes (in piano) was the happiest sound I ever had smiled with in this season. Together with the creatively-put visuals full of symbolism (the visuals, especially the ones in the chorus, weren't literally like that in the show). It was such a nice thing to watch this as an opener to a really light-hearted anime in this season. I love this opening. The beat was dance-able, the lyrics were singable and the visuals were just giving my that "epic" feel every time I watch it. I love it! This song gives me the hype I need to jump start this series. The chorus makes me want to bang my head around in circles! My favorite part is the one near the last bit where it was sang so high, Unfortunately, that part wasn't included in the video presentation so if you want to hear the full song, you have to search for it online. If I had to describe this opening in one word, it'll be "legendary". This song gives me goosebumps. The constant movement and the excellent animation gives me the feeling that I'm there! And don't forget that short pause in the beat after the chorus. Aghh that part got my hairs standing up when I first heard it. One word to describe it? The coolest! I just love how this opening makes an emphasis (and only shows) the coolest anime character in town - Sakamoto! It goes to show you how he makes the show "cool", "cooler", and "coolest". Oh by the way, I also LOVE this show's ending theme. Yep. It had to be Kiznaiver. I have never seen anything like this! The theme just feels so deep in lots of ways. The song makes you feel like flying and the visuals makes you feel like you're in a trance! I've seen people commenting "You don't need drugs when you have this." on this opening's youtube videos. It made me lol so hard. My favorite part is when everyone shows each other's different (and contradicting) personalities! Those animes with the red asterisks * means that their video/audio in the presentation is altered and edited. 1. I couldn't post it on Youtube because of copyright. I tried a lot times but Youtube won't budge so I uploaded it on my Google Drive Account instead. 2. I'll try my best to make the Top 20 endings list and post them on Google Drive as well as soon as possible! Hello guys! This short post is an update about my top 20 list! First, I'm NOT yet complete with the list itself! Yes, I am sorry but I can feel that I'm 80% done! A little more patience! Second, I still haven't gotten all the names of the songs and stuff so I can insert them on the videos. But anyways, I hope you'll enjoy this simple preview I created to showcase some of the shows that I've included in the list! Now go and get yourself hyped! Anyways, time for my daily anime watching! What are YOUR thoughts on the shows that I've included? In line with this post, I am officially announcing my new YOUTUBE account! Click this link to take you there (and don't forget to subscribe!). Hello guys! This will just be a short post giving you an update on the top 20+ list on this spring 2016's anime openings and endings. Yep! You've heard that right! It is now going to have 20 items unlike the previously mentioned number back in my old posts which is 10! I decided to add a few more to satisfy the fans, a bit, of the ones that I would have left out if it was going to be only having 10 items. Another reason is because there are just so many good songs this season... literally! And yes, I'm still having a hard time deciding the final positions of the songs but I am getting there! I promise. I grouped up several numbers into brackets so that I can get as exact with regards to the position of the song I'm gonna put, but it also makes it versatile just in case I want to re-arrange/order the songs. This method has helped ease down the process to a manageable one unlike using the manual picking-and-placing a song in the EXACT position number. But that is not to say I am complete though! There is still a few spots left that needs more re-thinking and revising so I hope you do wait with me 'till it gets done. I am planning on having it done by the time the weekend ends. Anyways, I also started downloading the opening visuals and songs so I can load them easily when it comes to the editing process. 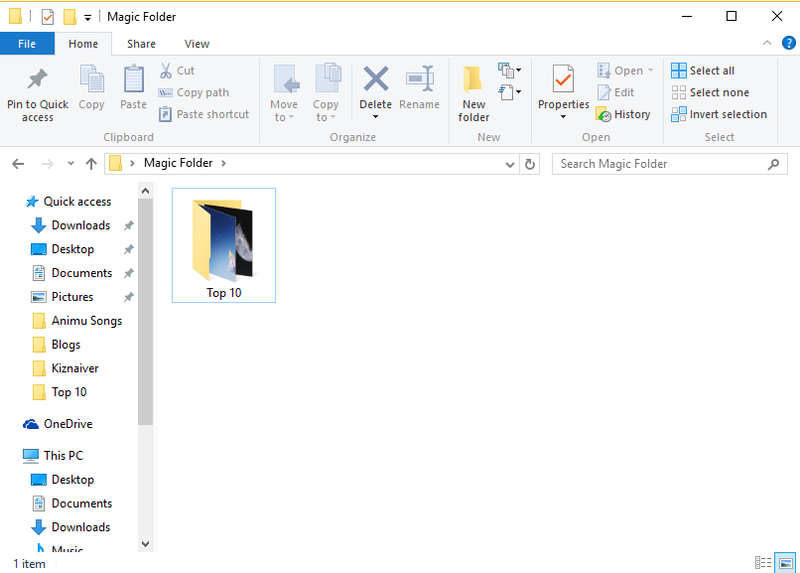 Top 20* Behind that magic folder is what you have been waiting for. That folder holds the candidates for my top openings and endings. Well, you guys already have a clue because as you can see from the folder on top, it already exposes some of the thumbnails of the anime openings/endings that I've included. Can YOU guess what is included in my top spring 2016 anime openings & endings? What is your concept on sharing pain with others? Have you ever even imagined what it would be like if people were to feel the pain you felt? Or maybe... have you ever imagined what pain the people that surrounds you feels like? The concept of sharing pain is something that I've never ever seen before in any anime. 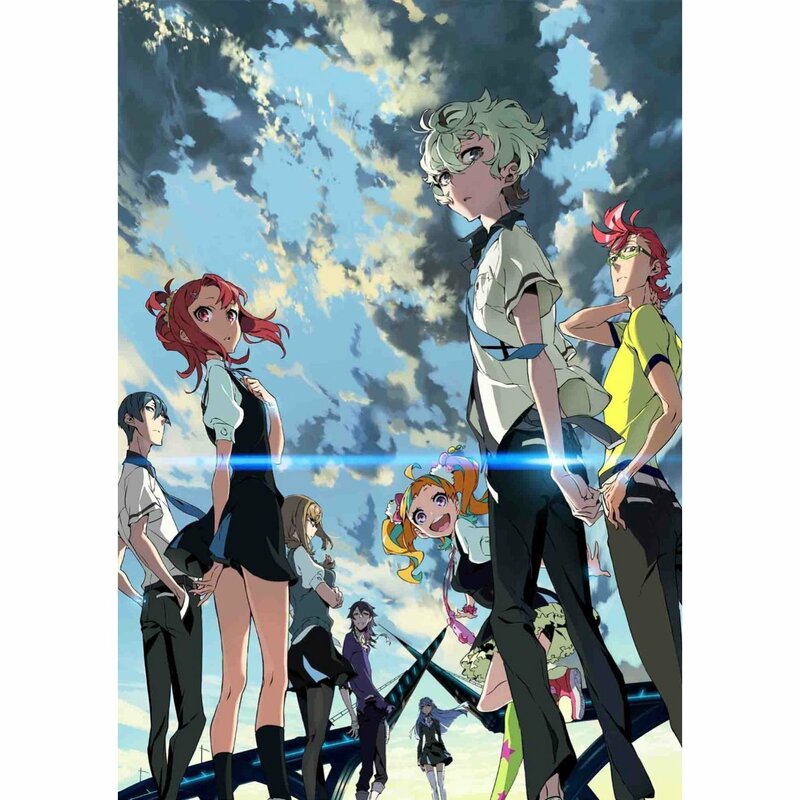 Going back to the topic, this is a really unique concept for me when I first discovered Kiznaiver so I knew I wanted to check it out. Similar to my Shounen Maid story, I only got to start and actually get into this show in the late spring season. I had A LOT of things in my watchlist for this season that I can barely keep track on what I also wanted to watch. A good push that made me try out this anime was not only just because of it's unique theme but also because of the fact that Shimazaki Nobunaga, a seiyuu that I adore so much, is actually voicing a main character from it. I wanted to fanboy over his voice and that made me press the link to watch it. So to get pumped up for it, I watched the mini previews as well as the pre-show episode - a simple documentary about the background of the whole anime series showing how much effort was made to produce the show. Though I didn't finish the latter one on my first try because I really couldn't understand some of the things stated there. Either way, I definitely saw lots of hype over this show mainly because it was handled by the studio called Trigger who were the makers of an another famous anime I've, yet, to watch called "Kill la kill". By the way, what does "Kiznaiver" mean? Kiznaivers are basically a group of people connected by their wounds. The opening song was decent at first hearing - it grew up on me as episodes went by until I basically became addicted to it. Every time I watch a series' first episode, I wanted to see something that will be the power hook I can use to keep coming back for more. Now the first few scenes, I must say, were okay for me. But did it give me the excitement factor? Not yet. It was only during the latter part of the episode after the mid-way point did it actually gave me that "I need to watch another episode" feeling. The way the unique & opposite characters interact with each other were entertaining. I felt excited because I knew this was not just going to be about sharing pain but also about developing friendships. About the pain thing? Yep! It did have that "sharing pain" element to it, literally. When I read the synopsis, the word "literal" didn't come to mind when it said "connecting with others through pain". "Katsuhira Agata is a quiet and reserved teenage boy whose sense of pain has all but vanished. His friend, Chidori Takashiro, can only faintly remember the days before Katsuhira had undergone this profound change. Now, his muffled and complacent demeanor make Katsuhira a constant target for bullies, who exploit him for egregious sums of money. But their fists only just manage to make him blink, as even emotions are far from his grasp. I low key wanted this anime to have feels - in the beginning I didn't think much of that as well though. The episodes went by keeping up with such a high level and I loved every bit of it (until I basically became Kiznaiver trash now). The intensity of the feels and the thrilling element it gives is also what I loved with this anime. 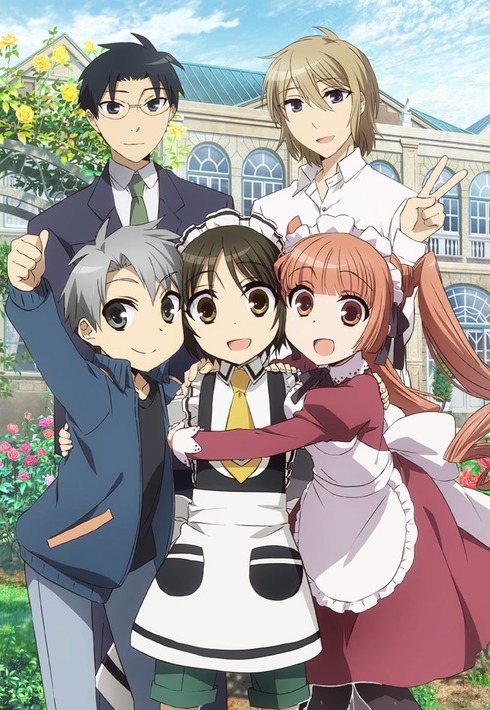 I wouldn't consider it to be an underdog like Shounen Maid as this anime literally blew my mind off from the start! As episodes went by, so does my love for this show grows. I'm actually selfish when it comes to the anime now to be honest, like I told my brother to back off and to not watch Kiznaiver because I love this precious baby so much. I really don't want to spoil so much. This anime deserves to be watched without any kind of spoilers whether it be minor or something major. I'm trying my best to actually not drop a lot of the good stuff here and to be honest, it's actually quite hard to write it that way because I feel so tempted to tell it you here. This anime is good at showing how intense the relationships and friendships between all of the characters grew. Concepts such as teamwork are also applied here as they are also sent on missions together as Kiznaivers. Anime with multiple characters can be quite a challenge when it comes to carving out and molding them into something more "human" especially if it's just an anime that's going to be done within 12 episodes. 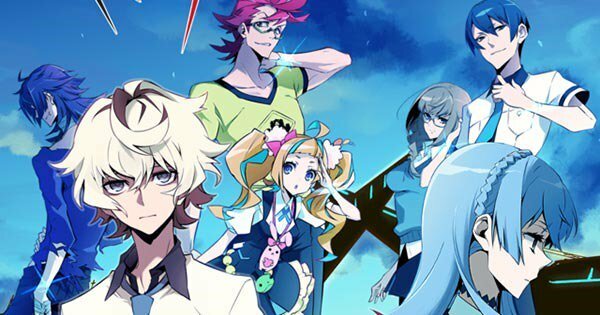 The characters in Kiznaiver weren't that "2D" as this anime always gives a chance for the other characters to have their own spotlight in an episode. Just like Shounen Maid, this is one of the spring shows that gets my eyes bawling when I watched certain episodes as well. That can be proven on the latest episode I watched which was on a Sunday where in I had my chest tighten & had my heart torn up as I cried so much on it. It was an INTENSE episode. I'm actually planning on watching the latest one when I have free time all to myself so I can watch it with privacy just in case it's going to be another episode full of feels. I almost forgot to mention and talk about the ending theme! Just like the opening, it was simply okay in the start but then it also grew up on me until it became a really heart touching song that gets my hairs standing up and my eyes teared up the moment it plays it's first note. That song didn't actually help lift up the pain a bit after watching that intense episode I told you a while ago - it only intensified it and made me cry even more. Here are the anime's opening and ending themes! Just a short trivia (a bittersweet one). 1. Boom Boom Satellites - Lay Your Hands On Me is the last career single of the Japanese group as one of the band members, Kawashima, had his tumors relapsed and became partially paralyzed. I am praying for his speedy recovery! 2. Sangatsu no Phantasia - From what I've heard on the pre-show episode of Kiznaiver, Hajimari no Sokudo is actually their first single ever in their career. Congratulations! 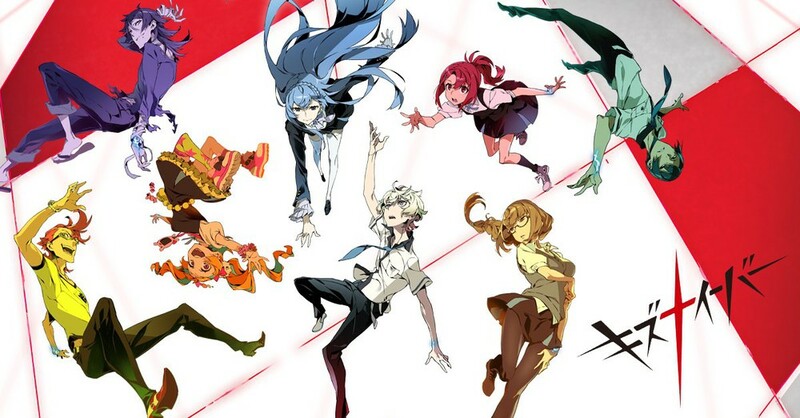 Short disclaimer, however, I haven't watched a lot of shows so if you did watch a show with the concept of sharing pain as well before Kiznaiver was even aired, you may comment them down below and tell it to me because I might add it to my watch list. So today, I bought a new keyboard! Hooray! I can finally start (and finish) my posts for this month. I hope you all would look up for that soon because I am stoked for what is coming up next *cough* another spring 2016 highlight* and *cough* sneakpeek on my top ten lists. Ooops! I spoiled you all a bit there! Anyways, look forward to that because as much as I was so excited and happy to have finally bought a new keyboard, I am AS excited to finally get more posts coming for you guys! Just a short rant! I'm having a REALLY huge trouble trying to rank and rate up the different spring 2016 anime shows because they are so good! I really need to finish it up as soon as possible because before you know it, SUMMER anime 2016 shows are coming up! It basically means that I'll be having another "What I Started Watching: Summer 2016 Shows" for you, my dear readers. Thank you so much for sticking by my blog! My school has started which means I am "supposed" to have limited time for blogging and all those types of stuff but... nope! I'm still going to set up my time always making sure I have something good installed for this blog. As the spring anime 2016 season draws near to it's closure. I find myself having limited time left to prepare and catch up with the shows I'm watching in order to give you my top picks for this season at the end of this month. Lots of animes have been crawling their way to my top spot while others may have been dropped by me. One of these animes that became an underdog in my personal top 10 shows for me this season is this show called Shounen Maid. Wanna know why? Read on ahead! It's rare that I usually find anime that is slow in it's pacing yet has that captivating substance the moment I hit the first episode. When done wrong, some of the slow paced animes especially when it comes to the adventure genre or those involving lots of action, tend to come out as boring to the eyes of the watcher. That's why making slow paced action anime tend to be a risky move to a mangaka and to those production companies who turn these into animes. 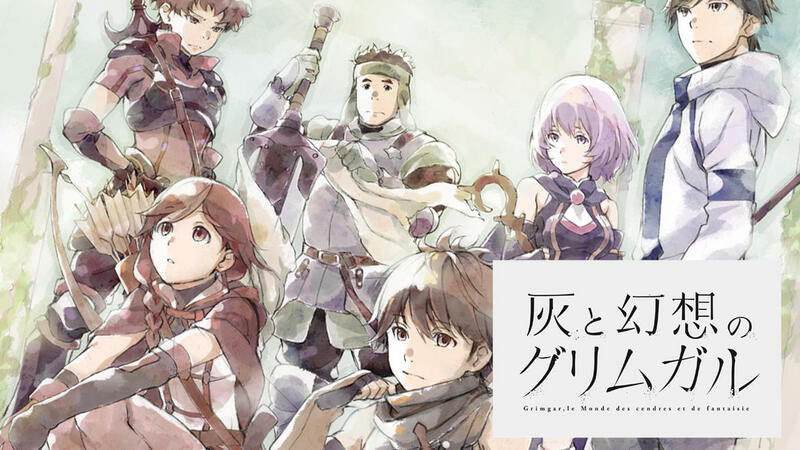 That's what Grimgar of Fantasy and Ash or in it's Japanese title, Hai to Gensou no Grimgar, proved wrong, for me at least and to countless others who believed in it too.. Instead, this anime used it's slow pacing and made it as one of it's strong points. Characters (from left to right to right) on top - Ranta, Moguzo, Shihoru & Manato. Guys this is just gonna be a super short update on my blog. As you can already see, there has been a huge change in the way my blog looks. Not only in the way it looks but also on the way it's direction is heading into. Basically, last night, I thought to myself that the way my blog is heading into in terms of it's content is a bit off. My blog is basically a mixture of both personal and an anime type of blog and I feel that those two themes don't mix well together. It's not like those blogs that are like about lifestyle + beauty where you can basically interchange those two and still end up having a cohesive blog. Mine, sounds a bit, off. I mean one minute, I might post something related to my fandom (let's say Owl City), then on the second post, I might beginn talking about manga... It just doesn't feel good mashing them up together. So anyways, I decided to split up my blog into two! One for my otaku + weeb needs and the other for my fanboy + personal needs. You can find that other blog right here! These two blogs are undergoing a really heavy renovation and that might cause a significant delay of posts coming from me. But! Please bear in mind that it's one the main priorities I'm focusing on right now so please bear with me.